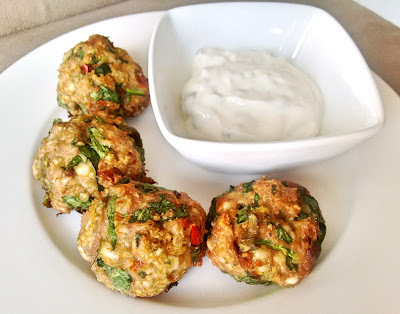 Chicken meatballs are a staple for us! I love being able to reheat them straight from the freezer, because it makes for a fast and easy meal. So far, Anna and I have made Italian and Thai ones, but we wanted to try a Greek style meatball. Store bought tzatziki sauce was the perfect match for dipping. Anna grew the onion we used, and I grew the chili peppers and basil, so this was the perfect summer recipe for our homegrown veggies! Preheat oven to 425°F. Line two baking sheets with aluminum foil and spray with canola oil. Finely dice vegetables, or put them in a food processor and pulse until vegetables are in small chunks. Combine all ingredients in a large mixing bowl. Coat your hands with a couple drops of olive oil to prevent sticking. Mash the ingredients together with hands, then form mixture into balls. Place evenly spaced on baking sheets. Bake for 18 minutes, meatballs should be lightly browned. Serve with tzatziki for dipping.